As a very early riser, I do most of my writing, candy reviewing included, at the crack of dawn. While Iâ€™m not averse to a little candy first thing in the morning, itâ€™s sometimes a nice change to be reviewing a candy that actually tastes like breakfast. 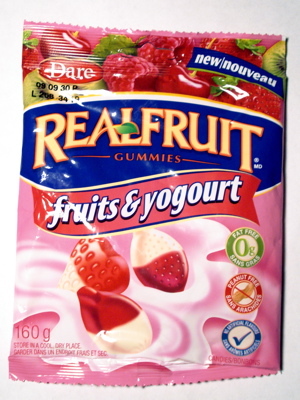 These Fruits & Yogourt gummies are a new addition to Dareâ€™s popular Realfruit Gummies brand â€“ gummies with natural fruit flavors and colors. Weâ€™ve previously reviewed them in fruit-snack form as part of our Back-to-School Fruit-Snack Roundup. As far as candy goes, theyâ€™re about as guilt-free of a choice as you can get â€“ and pretty darn tasty too, since they actually contain juice and puree from the fruits theyâ€™re flavored like, not just a lot of nutrition-light â€œfillerâ€ juices like apple and pear. So the originals are pretty tasty, but Iâ€™m usually wary of candies with â€œyogurtâ€ in their name. Usually, itâ€™s nothing more than an attempt to make a product look healthier than something coated in chocolate, when said â€œyogurt coatingâ€ is actually just an unholy amalgamation of hydrogenated oil and yogurt flavor â€“ so itâ€™s not only nutritionally equivalent to chocolate, itâ€™s nutritionally equivalent to very BAD chocolate, without even the scant health benefits of the real thing. Thatâ€™s not the case here, though â€“ the ingredients list â€œyogurt powder,â€ which is made up of modified milk ingredients and bacterial culture â€“ nothing wrong with that, especially since theyâ€™re also fat-free. From the moment you open the bag, they really do smell like fruit-flavored yogurt. Each gummy is divided into a fruit-colored half and a white, yogurt-colored half. (The bag is careful to tell you that the white color is also â€œfrom a natural source.â€) The fruit flavor is in the colored half, while the white portion contains the tangy yogurt flavor. This bag contains three flavors: cherry, strawberry kiwi, and raspberry. Cherry: For some reason, the cherry-flavored gummy is closer to a lemon shape. Itâ€™s not a strong cherry compared to the more commonly-used artificial flavor, but itâ€™s definitely cherry, like watered-down cherry jam. Raspberry: The raspberry gummy is a teardrop-shaped gummy with a stem on top. It actually looks closer to a plum than a raspberry. Without the legend on the back of the bag, I think Iâ€™d really have trouble telling which gummy was which, especially since theyâ€™re all a similar color. It actually doesnâ€™t taste that much like raspberry, more of a generic “tangy fruit” flavor â€“ but I guess neither does raspberry yogurt, since thatâ€™s definitely what this reminds me of. When eaten together with the white portion of the gummy, all the flavors really do taste like fruit-flavored yogurt, and with a similar list of ingredients to the real thing (sugar, gelatin, fruit ingredients, milk), Iâ€™d venture to say theyâ€™re probably even nutritionally similar. If you have to be eating candy before breakfast, you could do a lot worse. I enjoy gummies and yogurt (separately) a few times a week, so these actually sound quite good. It seems this variety is so new they’re not even on the Dare website yet. Jim – are you looking on the American part of the website or the Canadian one? I think these might be Canada only.